Sculptures By the Sea – What is Style? Last weekend my friend Rachel and I went wandering (with my camera) around the NZ Sculpture onshore exhibition at Fort Takapuna Reserve in Devonport. With panoramic views out to Rangitoto Island as the back-drop, we strolled along the cliff front where dotted across fields, in trees, along pathways, sculpture creations were springing out of the ground or swaying in the breeze. Some things just seemed odd – an artwork made of icing sugar; a gigantic lamp-post amongst a backyard of miniature rows of houses. It was all inspiring in its own way. As a voluntary-run event which was raising funds for Women’s Refuge – it was great to support an incredible cause and I look forward to next year’s event. SO I will let you be the judge on the photos that I took of the sculptures that caught my eye. 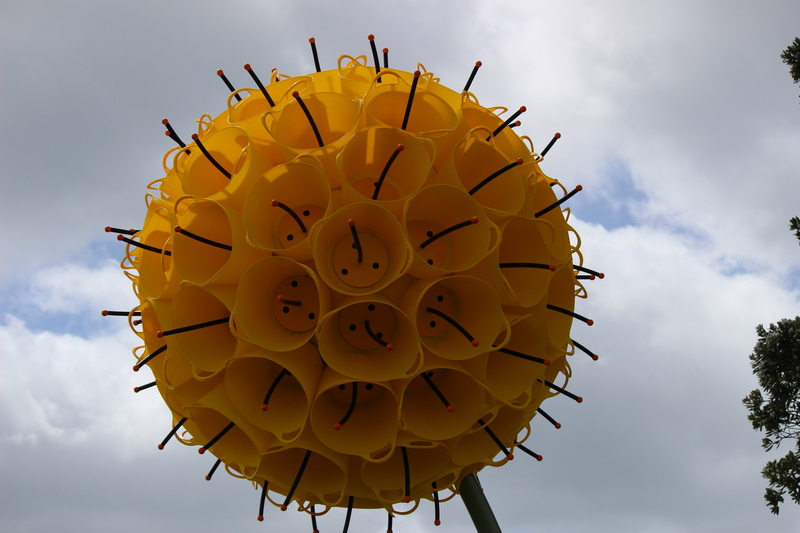 What amazing sculptures Yellow Tulip; thank you for making me aware of this display, will go next year for sure! I’m pretty sure it is an annual event and was definitely worth having a look through. Lets book a date for next year.